This bold move, with consequences we may not understand for months or years, unfolded with the predictably banal public order and conformity that typifies so much of Canadian life. I was anticipating a bit of a reefer free-for-all on day one, even though smoking anything is largely banned in most public places. Outside Centre Block on Parliament Hill on the day cannabis became legal in Canada. Nothing to see here. I drove into downtown Ottawa and parked the car in the By Ward Market. Along the sidewalks, all I could smell was whatever was being deep fried or grilled in nearby restaurants. I spotted several people smoking, but it was just boring old tobacco cigarettes they had between their fingers. 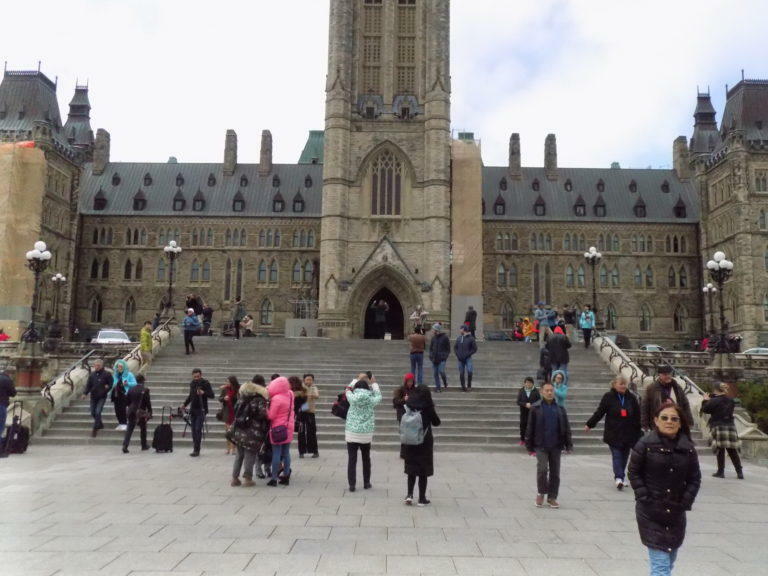 A walk along Rideau and Wellington Streets to Parliament Hill revealed similar results, tobacco and diesel fumes from passing trucks and buses. On Parliament Hill, it looked and smelled like any other Wednesday. 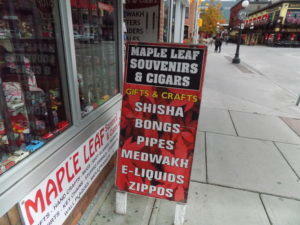 I expected to see people cheekily lighting joints from the Centennial Flame. Nothing, just the odor of natural gas that always wafts from the monument. Nobody was sneaking a patriotic puff outside the building where the legalization law, The Cannabis Act was passed. Portly politicians and their slim-suited underlings walked about among the dozens of tourists. The only offensive social behaviors I saw were too much selfie-taking and a man who spit on a sidewalk. The only joints on Parliament Hill were joint committees. Media reports from across Canada indicated there were only minor issues at cannabis retailers involving enthusiastic customers. Canada has six time zones. In Newfoundland, where private retail stores sell pot products, people excitedly waited until just after midnight to be the first legal purchasers of cannabis in Canada. An Alberta contact told me there was quite a lineup outside a private cannabis store in downtown Edmonton. Objects for smoking cannabis can be sold now in private stores, but the actual cannabis cannot be sold yet. By Thursday evening, CBC viewers were treated to photos of a Girl Guide (that’s Canadian for Girl Scout) in her uniform, who had anticipated many people would be getting the munchies and sold out her entire stock of mint chocolate Girl Guide cookies outside another Edmonton cannabis store. In Québec, legal cannabis can only be bought online or at outlets of the Société Québécoise du cannabis (SQDC), a government-owned chain of stores similar to the Société des alcools du Québec (SAQ), which sells retail liquor. There are only six SQDC retail outlets right now, so in Gatineau, there were no doobie door crashers there, although a CBC report did say people from Gatineau had traveled to one of the SQDC stores in the Montréal area. Retail reefers in Ontario are only legally available online right now, from the government-owned Ontario Cannabis Store (OCS). The previous Liberal government had planned to open actual OCS locations, but the new Conservative government decided free enterprise was the way to go and have private stores instead. 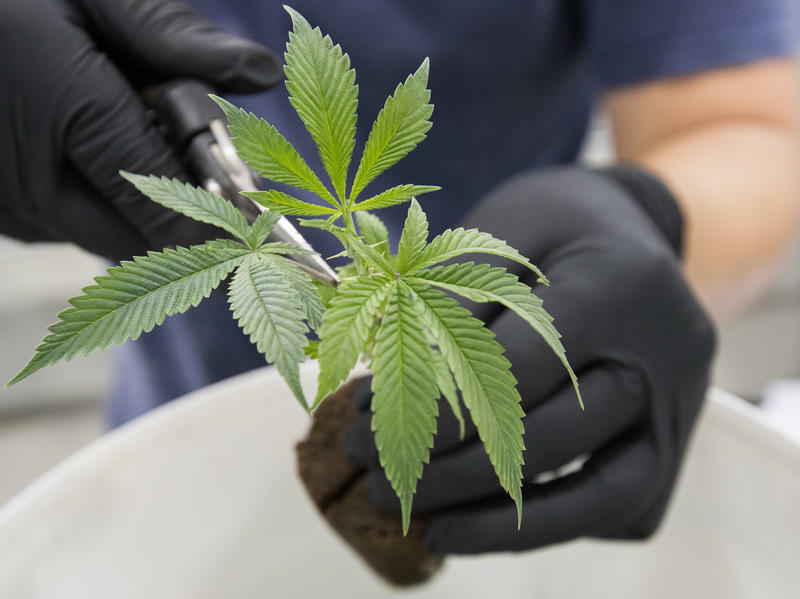 However, the announcement came too soon before the federally-imposed legalization day and private pot purveyors won’t open for a few months. The biggest sources of confusion on and around legalization day are the potpourri of laws that change from province to province and depending on the local jurisdiction. The basic federal law allows for any adult to legally possess up to 30 grams of cannabis for personal use. Green-thumbs are allowed to have up to four plants in their home for personal use too. However, provinces are already trying to make changes. The legal age to have weed in Ontario is 19, in Quebec, it’s 18. Quebec is trying to stop people from having their own plants and is considering raising the possession age to 21. Ironic for a province where bars stay open until 3 a.m. The smoking laws are inconsistent too. In Ontario, marijuana smoking will only be allowed in the same places where cigarette smoking is allowed under provincial law. The same goes for Québec, but its law is less restrictive than Ontario’s. So many Québec towns and cities have responded by passing their own cannabis smoking ordinances. In Lachute, where the town council went a step further and decided to ban public puffing in all places, even on sidewalks. Other towns and some Montréal boroughs have passed similar laws. Reports on the efficacy of roadside screening for high drivers have been inconsistent as well. News stories have been inconclusive on what testing equipment police forces are using, if that equipment is reliable, and if all police forces are enforcing the new laws on driving while high, or the old ones. The Ontario Provincial Police (OPP), known for their RIDE (Reduce Impaired Driving Everywhere) program of roadside checkpoints for drunk driving, recently tweeted that their Eastern Region wants everyone to help them “Weed out impaired drivers.” The OPP wants to make sure nobody behind the wheel is one toke over the line. The old law prohibiting cannabis possession and the illegal trade of it was being enforced right until the very end. According to Twitter (which is always right), on October 10, provincial police in Québec arrested a man for allegedly growing cannabis for the purpose of trafficking in a town north of Montréal. The federal government is considering offering pardons for people convicted of possessing minor amounts of marijuana many years ago, but how easily those pardons will be offered and how accessible they will be is still unknown. I finished writing this 71 hours and seven minutes after cannabis became legal in Canada. The whole country hasn’t gone to pot, but there are still many details to emerge from the haze.